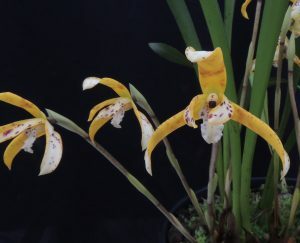 Today the whole of the greenhouse was filled with the most gorgeous scent thanks to our large plant of Maxillaria picta. Presumably the plant had survived the fire that had swept through this patch of forest about thirty years ago and carried on growing on its now dead tree which has since fallen. 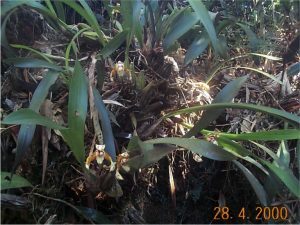 The regrowth forest still lets plenty of light down to ground level and so the plant is growing and flowering happily. Our school plant still has away to got to reach the size of the Brazilian species but with six to eight flowers per bulb it is getting there fast. We are looking forward to the day that this plant is 1.5m across. We grow the plant in Cool Americas and water it throughout the year. The moss that has grown on the top of the pot shows just how wet we keep it in the summer. 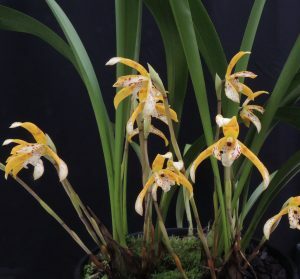 We are sure that the plant will still be in flower for Orchid Christmas on 12th December but as the scent reduces at night it will be those who arrive at 6pm when we open that will get the best of the species.